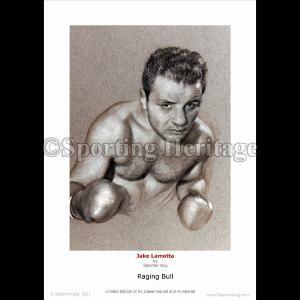 Jake LaMotta Steiner Authenticated Autographed 24x36 Movie Poster Inscribed "Raging Bull"-Jake LaMotta had one of the best chins in boxing history. In over 110 fights against the greatest middleweights in history LaMotta was only knocked to the canvas once in his entire 14-year career. Turning pro in the early 1940s LaMotta ran up an impressive undefeated streak before losing. He was the first fighter to defeat the great Sugar Ray Robinson Robinson was 40-0. LaMotta claimed to have 'taken a dive' against 'Blackjack' Billy Fox in New York City. Later LaMotta captured the World Middleweight Title from the legendary Frenchman Marcel Cerdan. So fascinating was LaMotta's life and career that director Martin Scorsese made the film classic Raging Bull about him with Robert De Niro delivering an Oscar-winning performance as La Motta. This Jake LaMotta autograph is Guaranteed Authentic and includes a Steiner Sports Certificate of Authenticity and accompanying tamper-proof Hologram of Authenticity.